The enclosures that protect them must have strictly controlled internal environments with temperatures that are carefully maintained within a few degrees. If not, the impact can be harmful to the a.c. inverters, power supplies, contactors, PLCs and other electrical and electronic components operating within them. This requires careful control of the climate within the enclosure. Here, Rittal Product Manager for Climate, Jason Swann, offers some practical tips on how to evaluate an existing enclosure climate control through a series of simple checks. 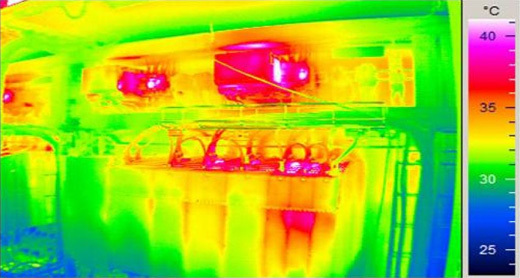 Like all electrical equipment, a.c. inverters create heat and therefore have a major influence on the temperatures inside enclosures. An a.c. inverter is often quoted as having efficiency of 97%, so one with a rated output of 150kW can produce as much as 4.5kW of heat. As well as the heat loss inside the enclosure, ambient temperatures within a production facility will also have an impact on the temperatures that an a.c. inverter is operating within. A typical climate control system is designed for an internal enclosure temperature of 35°C. This means that the performance of a cooling unit should be specified so that the average internal enclosure temperature of 35°C can be guaranteed under all load conditions and under all ambient conditions that could be met at the machine’s location. The first check is to measure the temperature within the enclosure to assess its climate control capability. Temperature sensors should be placed in a position within the airflow of the enclosure (not placed on or near direct airflow from high temperature components - otherwise temperature readings can be inaccurate). The sensors should be left to monitor the temperature trend over a period of time. If the sensor records air temperatures of well over 35°C (set point) then the output of the cooling unit should either be considered insufficient or, alternatively, that there has been a malfunction of the cold air routing in the enclosure. This means the cooling air cannot reach (or can only partially reach) the temperature-sensitive components. 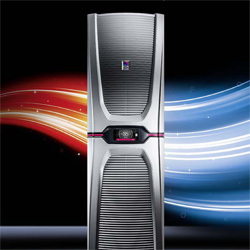 Unlike speed-controlled cooling devices such as the new Rittal “Blue e+” cooling units, conventional enclosure cooling units begin with the two-point regulation of the cooling operation when a temperature inside the enclosure gets above of 35°C and finishes when the shutdown temperature of 30°C is achieved (at a typical hysteresis of 5K). If a cooling device does not reach the shutdown temperature, a conventional cooling unit will continue to operate. This is a good indication that the cooling unit has an insufficient output and suggests there is likely to be a deficiency in suitable cooling air to the components inside the enclosure. You can simply touch a device to determine a refrigerator’s operating status: the activity of the refrigeration compressor during cold production is accompanied by a slight vibration of the refrigerator housing that can easily be felt. Alternatively, the exhaust temperature of the cooling unit in the external air circuit may be measured. During active cooling operation, this will be significantly higher (potentially between 10° and 40°C) than the ambient temperature. You can also do a rough check of an enclosure’s climate control system with infrared thermography which uses an an infrared camera to measure the surface temperature of the components inside the enclosure. If any areas have significantly elevated temperatures (“hot spots”) it shows they are not being supplied with enough cooling air.